The NBC10 Newport International Polo Series, Presented by BMW featured a heated rivalry between USA and Italy, with Italy vying for the elusive Silver Cup on Saturday, July 8th. Representing Team Italy, in the #1 position was Lanfranco di Campello, playing #2 was Massimo Elser with Captain Marco Elser as his alternate, Peter Elser was at #3, and playing #4 was Marcos Antinori. Representing Team USA, Sam Clemens was at #1, Captain Dan Keating was #2, Jim DeAngelis played #3, and Dave Bullis played position #4. Team Italy kicked off the first chukker of the match with a goal by Campello, but Team USA answered with a goal scored by Clemens. Italy fought back with a goal by P. Elser to end the first chukker with a score of 2-1 with Italy in the lead. Team USA kicked it into gear, scoring three consecutive goals by Bullis, Keating, and DeAngelis. Italy pushed back with a goal scored by Antinori, but USA answered with two goals scored by Bullis and Keating. Italy had the final goal of the second chukker scored by Antinori; bringing the score to 6-4 with Team USA taking control of the lead. The final chukker of the first half started off with three consecutive goals for Team USA scored by Clemens and DeAngelis (two goals), Team Italy answered with a goal scored by Campello bringing the score to 9-5 to end the first half of the match. Team USA took control during the fourth chukker with three consecutive goals scored by Keating and DeAngelis (two goals) to end the chukker with a score of 12-5 with Team USA holding onto the lead. Team Italy started off the fifth chukker with two goals by P. Elser and Antinori, but Team USA answered with a goal by Clemens. 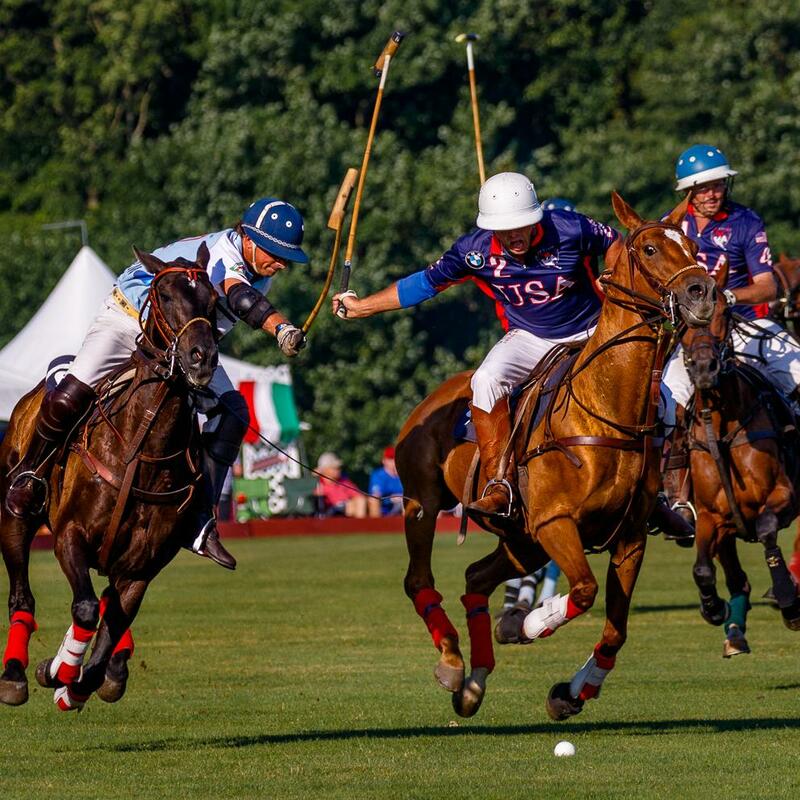 Team Italy continued their momentum scoring two more goals by P. Elser and Massimo Elser; bringing the score to 13-9 with Team USA in the lead going into the final chukker. Team USA kicked off the final chukker scoring two goals by DeAngelis and Clemens, Team Italy answered with a goal by Antinori but it was not enough to regain the lead. Team USA won the high scoring match with a score of 15-10. During the match, the door prize drawing of a Magnum of Veuve Clicquot Champagne was awarded to one lucky attendee from West Greenwich, RI. A bellissimo tailgate with gorgeous, Italian themed décor and a mouth-watering spread of food and drink won the Best Tailgate Picnic Trunk from Stella Artois.